Theresa Wahl, chef-owner of L.A. retro-hip hotspot Auntie Em's Kitchen, showcases her simple and beloved recipes for breakfast, brunch, and dessert in a cookbook that celebrates seasonal and local flavors. Drawing inspiration from her past as a punk guitarist, Wahl pairs her recipes with a playlist, sharing her belief that food tastes better when there's music in the kitchen. Rich with photography by David Kiang, The Auntie Em's Cookbook takes American comfort food into the modern era with a relaxed style and a commitment to deep flavor. Theresa Wahl is the chef and owner of retro-hip hotspot Auntie Em's Kitchen in L.A.'s Eagle Rock neighborhood. In the 1990s, Terri was a singer and guitarist for the Red Aunts, an all-female punk band that toured the U.S. for a decade. 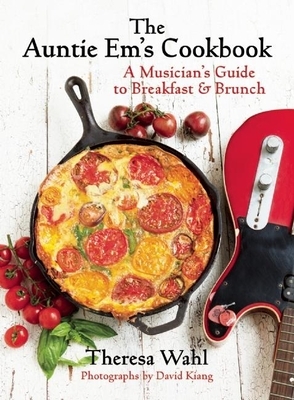 Her travels inspired a love of hearty American home cooking, and when she retired from performing she started catering gigs for bands and their crews. This led to the 2002 opening of Auntie Em's Kitchen, where she quickly developed a following for her baked goods and comfort food with a punk-rock edge. Wahl lives in Eagle Rock with her two dogs and several chickens.